Curve studied by Grégoire de St Vincent in 1647 and Cramer in 1750. Name given by Aubry in 1895. Camille-Christophe Gerono, 1799 - 1891: French mathematician. Cartesian equation: or or also . Rational Cartesian parametrization: ( , ). Cartesian parametrization of the image by a rotation by : with . The lemniscate of Gerono is a special case of besace (see this page for a construction) and of Lissajous curve (cf. the parametrization: ). The lemniscate of Gerono is the antihyperbolism of a circle with respect to its centre and a tangent. Another construction, due to L. I. Magnus: while describing a circle, a point P is projected on Q on a diameter, the point Q is projected on R on (OM); the lemniscate of Gerono is the locus of the point M of [PQ] such that QM = QR. The equation shows that it can be obtained as a polyzomal curve, median of the parabolas and . 1) Projection on xOy of the pancake curve, parametrized by: . 2) Projection on xOy of the Viviani window: . 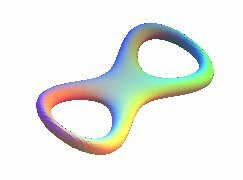 More generally, the lemniscate of Gerono is a view of the horse fetter, intersection of a sphere and a tangent cylinder. The lemniscate of Gerono can be obtained from the lemniscate of Bernoulli in the following way: trace on the sphere with centre O and radius a the curve (Viviani's curve) the south pole stereographic projection of which is the lemniscate of Bernoulli, and project this curve perpendicularly on xOy. Bernoulli is in red, Viviani, which is projected on Gerono, is in blue. A difference between the lemniscate of Gerono and that of Bernoulli: the first one has six vertices (4 maxima of curvature and two minima) as the opposite view with its evolute shows; the lemniscate of Bernoulli only has two vertices, at both ends. - the Tannery pear, rotation of a half-eight around its axis. - the Klein bottle, a representation of which is based on an eight, as well as the pseudo cross-cap. If the equation is changed into , we get the red curve opposite, with polar equation , and parametrization: . Its reunion with the lemniscate of Gerono gives a curve close to the bow tie. If is changed into we also get a curve with the shape of an eight, also parametrized by . See here how to "thicken" an eight: . See also the biaxial inverse of an eight.